Dreams to celebrate the second birthday of their daughter were shattered as she was crushed under a rear wheel of a school bus in the Central Town area of the city this afternoon. A taxi driver, Gagan, was allegedly stabbed to death by some youths after a scuffle over Rs 50 late last night. Following the incident, Kishanpura residents blocked the Kishanpura Chowk last night. The police had to face tough time in handling the situation. The city police today arrested two brothers for allegedly beating up a emergency medical officer (EMO) of the Civil Hospital late last night. The Punjab Pollution Control Board (PPCB) has issued notices to 35 industrial units operating from the city and its vicinity to shut their electroplating plants. These industrial units have been operating without the board’s permission and had also not joined the common effluent treatment plant (CEPT). They were found discharging effluents in the main sewer. High drama was witnessed in the office of the chairman of the Jalandhar Improvement Trust (JIT) this afternoon where he had invited the Mayor of the Municipal Corporation to receive a cheque for Rs 5 crore for carrying out development works in the city. It must be for the first time that a certain schools’ sports day plan hasn’t cheered students up. Commuters crossing over the busy DAV railway overbridge (ROB) were a harassed lot as the Municipal Corporation was getting the road re-laid on its one side today. Two-year-old Bramjap was with her mother, Kanupriya, on the main gate of their house to receive her elder sister, Mehar, when the tragedy struck. Mehar, a playway student of Euro kids, had just reached home in a school bus that ran over Bramjap, killing her on the spot. 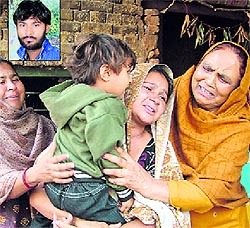 Eyewitnesses revealed that Kanupriya approached the bus for a handkerchief which Mehar had forgotten. Bramjap, who was trailing her mother, stood right next to the rear tyres of the bus and was crushed as the driver accelerated the vehicles, unaware of the child’s presence at wrong place. As soon as the bus driver heard Kanupriya’s shrieks, he fled the spot leaving the vehicle behind. Residents of the area gathered and informed the police. The mother was in a shock and was cursing the errant bus driver. 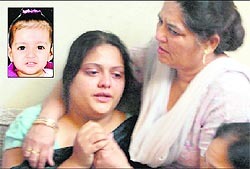 Inconsolable family members were stunned as the body of the child lay in front of their house. A neighbour revealed that the family was planning grand celebrations on her daughter’s second birthday on November 21. “Yesterday, Bramjap along with her father had gone to the market to buy things to celebrate her birthday. She had bought new dresses, toys, cookies and other gifts and she was eagerly waiting for her birthday,” a neighbourhood woman said. Residents of the locality accused the bus driver of rash driving. They alleged that no one from the school came to show sympathy to the bereaved family. Inspector Balwinder Singh of Police Division No. 4 said that driver of the school bus has been identified as Prabhjeet. A case under Section 304-A of the IPC has been registered against the accused. A taxi driver, Gagan, was allegedly stabbed to death by some youths after a scuffle over Rs 50 late last night. Following the incident, Kishanpura residents blocked the Kishanpura Chowk last night. The police had to face tough time in handling the situation. The incident took place around 9 pm when 25-year-old Gagan and his friends went to the locality to collect donations for a religious function. 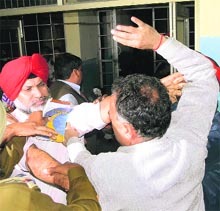 Gagan’s friends claimed that some youths of Santokhpura locality indulged in heated arguments with Gagan over Rs 50. They said the youths were carrying sharp-edged weapons and one of them stabbed Gagan in his chest twice. The accused later fled the spot. Gagan was rushed to a nearby private hospital from where he was referred to the Civil Hospital where he succumbed to his injuries. Residents of the area and family members of the deceased again blocked the Kishanpura Chowk this morning demanding immediate arrest of the accused. Sensing trouble, Additional Deputy Commissioner of Police (ADCP) RK Sharma along with around 70 police personnel went to the spot to control the situation. The ADCP said a case under Sections 302 and 34 of IPC had been registered against the accused, identified as Sajan, Sunny and Billa, all residents of Santokhpura. The police has been conducting raids at the hideouts of the accused. The ADCP said that weapon used in the crime was yet to be recovered. A case under Sections 353, 186, 506 and 332 of the IPC has been registered against the duo, who have been identified as Kuljit Singh and Gurjit Singh, residents Green Model Town and Urban Estate Phase 1, respectively, at the Police Division No. 4. The incident took place around 11 pm on the premises of the Civil Hospital when the duo allegedly forced the emergency medical officer, Raj Kumar, to change the medical legal report (MLR). Kuljit had a fight with his third brother a few days ago, who had allegedly beaten him over some personal issues. Dr Rajkumar had prepared the medical legal report of Kuljit according to the injuries he sustained. As per the MLR prepared by the doctor, Kuljit’s injuries were not severe but Kuljit’s brother Gurmeet was opposing the report and wanted the doctor to prepare a report mentioning severe injuries so that they could register a case under Section 326 of the IPC. “How can I write severe injuries in the report when the injuries are simple,” Rajkumar said. Sources said that on the objection of Gurmeet over the MLR, medical authorities even held a discussion in the panel of three doctors and declared the MLR prepared by Rajkumar right as per the law. Balwinder Singh, SHO, Police Division No. 4, said after the scuffle between the doctor and duo, it came to fore that the duo was under the influence of liquor. The SHO said the accused had been arrested. The Punjab Pollution Control Board (PPCB) has issued notices to 35 industrial units operating from the city and its vicinity to shut their electroplating plants. These industrial units have been operating without the board’s permission and had also not joined the common effluent treatment plant (CEPT). They were found discharging effluents in the main sewer. SP Garg, senior environmental engineer of the board, said 14 units had been served notices under Section 33-A of the Water (Prevention and Control of Pollution) Act, 1974, asking them not to operate their electroplating plants. The PPCB has also identified some more industries which were operating without the consent of the board and had also not joined the CETP to achieve zero liquid discharge from the electroplating process. Strict action has already been initiated against these industries, Garg added. The board has already advised all electroplating units to send effluents for treatment to the CETP at Ludhiana instead of discharging it into water bodies. The board has also issued warning to electroplating units which have not joined the CETP and asked them to get the membership of the Ludhiana Electroplating Treatment Society immediately or face action. Garg, however, claimed the board had successfully reduced the flow of heavy metal into Satluj river with the setting up of the CETP in Ludhiana. The plant is being operated by the Ludhiana Electroplating Treatment Society (LETS) to ensure zero trade effluent from the electroplating process. He said 151 electroplating industries have already joined the CETP. The society has been lifting the effluents for treatment at Ludhiana. The duo indulged in a war of words in full media glare for good 20-25 minutes. While Mayor Rakesh Rathour insisted that he be handed over a cheque for Rs 15 crore, JIT chairman Baljit Singh Neelamahal claimed that he could not exceed the amount at the moment. “At the most, I can ensure you Rs 5 crore in the coming days or get your works done for the same amount,” the chairman retorted. Since the Mayor and the CPS are on good terms with one other, the former could not take it too well, but somehow remained cool. “You had committed that the cheque would be ready at 11 am. I have been calling you since morning and it is now 3 pm and the cheque is still not ready,” the mayor shot back. The JIT chairman tried to wind it up saying, “We will get the cheque ready today and deliver it to you as soon as possible.” The duo hugged each other for the photographers, following which the Mayor left in a huff. Even as the MC did not get the cheque for ~15 crore from the JIT, the Mayor seems to have managed to convince the contractors to get the new works started. Tenders for the new works were finally opened on Friday. The Mayor also held two inaugural functions of road laying in the city for ~88 lakh. 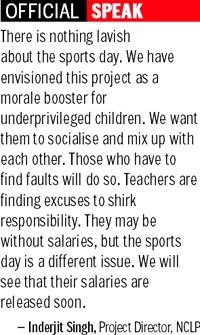 The upcoming sports day celebrations for the students of the National Child Labour Project (NCLP) schools in Jalandhar, Ludhiana and Amritsar have infuriated the already glum-faced teachers working under the project and students in the city. Sans salaries (in the case of teachers) and stipends (students) with their morale on an all-time low, the NCLP schools’ staffs have been told that their children will be playing 12 games (many of which they haven’t even heard about). Most of the NCLP schools in the city don’t have playgrounds and the information regarding the games, to take place in Ludhiana on November 30, has been given to the schools only a week ago. The teachers have been told to train students in complicated games like kho-kho, kabaddi, discus throw, long jump, etc, for which they don’t have basic infrastructure, equipment (or playgrounds), in two weeks. The teachers lament that when the government can splurge loads of amounts on a grand-scale inter-district sports days, why can’t it pay them and the children long-pending dues. “All children will be given lunches. Elaborate preparations will be made to charm VIPs. They will pay for the students’ conveyances. They are ready to do all that, but they are not ready to pay us,” they add. While the NCLP schools’ teachers are yet to receive their salaries of the past eight months (from April 2011), the students, who were enticed into the NCLP project with the very promise that they will get monthly stipends of Rs 100, haven’t got the same since September, 2010. In a meeting scheduled on Monday, the authorities will decide when the Jalandhar-based contests will take place (to shortlist students for the final sports day). Originally mooted by the ADC (Development), Ludhiana, and backed by Inderjit Singh Project Director, NCLP, the plan for the sports day will see four children (each) participating in each of the 12 games from all 27 NCLP schools in the city. It is mandatory for all 27 NCLP schools to send students for the sports day. Plan announced just a week ago and to some schools just day before yesterday. Teachers have just less than two weeks left to train students. Since the ROB falls on the Jalandhar-Amritsar highway, all heavy vehicles, including trucks, trailers and city buses, were caught in the jam, owing to the use of just one side. Since the wholesale vegetable market, main grain market and at least 10 educational institutes also fall in the vicinity of the bridge, the commuters faced a tough time owing to traffic snarls throughout the day. While the bridge was inaugurated in May this year, there have been complaints of breaking of roads and cracks in the sidewalls ever since. The MC had been getting the patch works done to get it covered up. 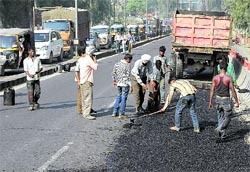 Today, employees from Gammon India, the private contractors, had been asked to re-lay the road all over again. The problem aggravated as the MC had simultaneously also started the repair work at Mahavir Marg around the Football Chowk area. All those who thought of using it as the alternative route to avoid the traffic were rather caught up in a bigger mess as this route, too, was made one-sided till the laying of premix.